The dedicated people at Golden Rescue South Florida truly have a heart of gold. They believe that all animals are part of a sacred creation and should never be treated as “commodities, things or garbage”. They are a can-do group of people and work tirelessly to improve the lives of Goldens and other rescued dogs. One of the most admirable qualities of this rescue is their deep understanding and compassion for the dogs that they rescue. 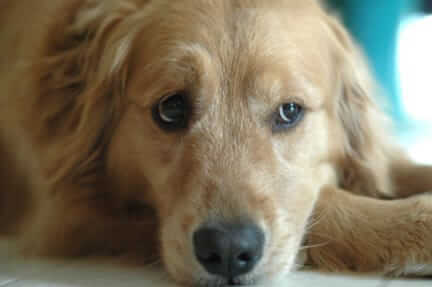 They realize the truly horrific and debilitating lives the majority of their goldens have experienced. The toll these experiences have taken on these animals can be devastating. Many have been pushed around from one terrible situation to another. Some have lived outdoors without adequate shelter and subjected to extreme cold or heat, while others have been housed in dark basements or relegated to crates for long periods of time. Many have never received proper training or veterinary care. And, rarely have these dogs received the attention of loving human companions and so they are often inadequately socialized. Basically, these unfortunate animals are scared, depressed or anxious. However, the dedicated staff of Golden Rescue never gives up on these beautiful souls. They know that with some care and extra attention, the resilient spirit of the Golden will overcome the hardships of the past and become a loving, loyal and joyful member of a family. Founded in 2000, in their very first year, this rescue adopted out 28 Goldens. And, as of January 2009, 156 grateful dogs have thus far found loving, forever families. Golden Rescue does not have a facility that houses the dogs. Instead, they have a devoted group of foster families that nurture the rescues until they are adopted. The Goldens come to the rescue in several different ways. Many of them are given up by their owners who cannot provide the dogs with the attention they deserve or the medical treatment they need. For those who ask, the rescue stays in touch with former owners, sending them updates and even photos that reveal how the dogs are doing with their foster families. The rescue also receives Goldens from overflowing shelters, as well. All of the dogs that come into Golden Rescue receive proper medical attention, afterwhich they are vaccinated, spayed or neutered before they go to live with their foster families. This wonderful organization has many heart-warming and inspiring rescue stories. By choosing to purchase Trilogy and HealthyPetNet products, you are directly supporting the work of our foundation, and we thank you for making this generous award to the Golden Rescue South Florida possible. Your continued patronage has made a direct impact on these rescued Goldens and also the lives of untold numbers of homeless animals cared for by other agencies, too. If you wish to send additional support to our foundation, you may do so when placing an order online or by sending a personal check to The Dr. Jane’s HealthyPetNet Foundation, Inc. at P.O. Box 1425, Palm City, FL 34991. Even if you can only spare a dollar or two, you’ll be providing much needed aid to the organizations attempting to reverse the trend of abandonment in America. Oh, this is wonderful and gives my heart a tug for the beautiful goldens. HERE IN MINNESOTA WE HAVE A WONDERFUL RESCUE GROUP CALLED RETRIEVE A GOLDEN OF MINNESOTA. WE RESCUED A 9 MONTH OLD MALE WHO WITH HIS LITTER MATES HAD SPENT THE FIRST 6 MONTHS IN A PIG BARN IN IOWA. NONE OF THE 8 OF THEM KNEW ANYTHING ABOUT DOORS, STEPS, OR ANY OF THE COMMON NOISES OF HOME LIVING. THANKS TO HIS WONDERFUL FOSTER MOM CAMERON IS A LOVING, HAPPY AND GOOFY ADDITION TO OUR HOME. HE WILL BE 2 IN JUNE AND FITS IN THE PACK WITH OUR OTHER 3 PUPS LIKE HE WAS BORN AND RAISED HERE. WE LOVE OUR CURLY GOOF BALL!!!! Thank you Dr Jane for helping all the dogs and cats and the rescues who help them find forever homes!